Happy Thanksgiving to all of my fellow Americans. This is the day of the year my son lives for. He is a walking stomach; he pretty much lives from one meal to the next and he starts looking forward to the next Thanksgiving about the time I start the dishwasher after the current one is done. I just do the usual, turkey, stuffing, green bean casserole, mashed potatoes, gravy, sweet potatoes, corn, rolls. I'm not much of a cook but if I stick to the formula, I can knock together a halfway decent Thanksgiving feast. So, in celebration of this, the most festive feast day of the year, I decided to do a little nail art. Oh, hush up. I do this from time to time. I started with two coats of China Glaze Call of the Wild and topped it off with Seche Vite. This polish seriously looks like hot, melted dark chocolate all over your nails. It is scrumptious. I let it dry for a while. Was I lying? Now, I know what you are thinking. Wait a minute, she doesn't even like brown. You're right. I don't, normally. But this one... Yeah. It's just too fabulous. It's rich and dark and flattering and I just love it. After it dried for a bit, I stamped leaves on my nails with an old Bundle Monster plate. I can't remember the number and I am not trekking downstairs on this foot (I royally screwed up my middle toe on my stairs, yesterday... walking is interesting, stairs are like Everest) just to look at it. If you have the old BM plates from 2010, you know which one it is. I stamped the leaves with China Glaze 2030 and Hi-Tech. Then I let them dry a bit and topped them with a coat of China Glaze Golden Enchantment for a delicate all over sparkle. Next I applied a freehand funky French with China Glaze I Herd That then topped the whole thing with a coat of Gelous and a coat of Seche Vite. Of course, I had to make some mistakes while stamping. It wouldn't be my work if I didn't bungle it, somewhere! Dodgy stamping aside, I am really happy with how this turned out. It's warm and golden and sparkles beautifully in the sun. It makes me happy. And, because I can't leave well enough alone, I am going to include a funny cat picture that I found on Facebook, I think and have kept stashed on my hard drive until today. I hope that you all have a happy, safe and delicious Thanksgiving, if you celebrate. If you don't, Have a great day! I like how your nail art turned out! Very festive and fall-like. 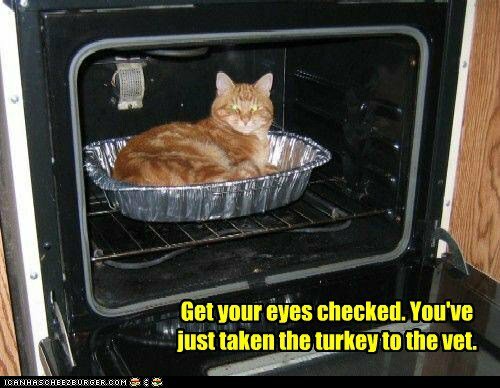 I hope you have a beautiful day and your Thanksgiving feast turns out delightful! hhahah that picture at the end made me laugh so hard :) that polish really is gorgeous! pretty stamping - love the mani. Thank you so much! :D I did have a great Thanksgiving and I hope that you did, as well. Thank you for reading and commenting. This is just gorgeous! You did an excellent job!